At our Washington, DC practice, we’re always glad to see our patients’ oral health improve. We love watching everyone learn how to better care for their teeth and whiten and brighten their smiles in a healthy way. Unfortunately, we also diagnose cases of oral cancer more often than we would like to. 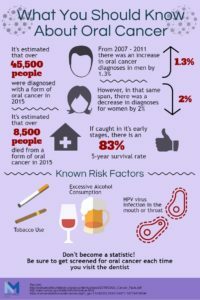 In order to keep all of our patients healthy, we’re here today with some information about oral cancer.